Who the hell would want one of these? Um, everybody? They are so weird that they roll over into awesome. 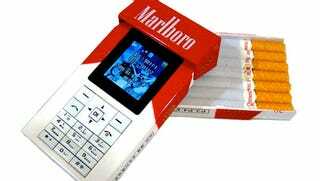 The Marlboro 508, a Chinese phone with actual space for cigarettes. It has also a 3 MP camera on its side, which is ideal for awesome spy shots. The Golden Buddha, with 24k gold paint job and a real piece of jade. Some of these were sold in China for $1,750 five years ago.